Distributing goods at the Red Cloud Agency, illustration from Harper’s Weekly, 1876. These two installations along the White River in northwestern Nebraska were the scene of many exciting events during the final two decades of Sioux and Cheyenne resistance on the northern Plains. 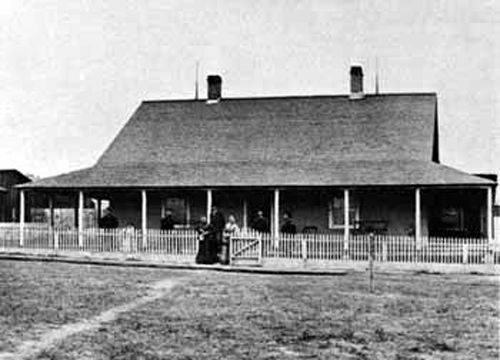 The fort was founded in 1874 to protect the Red Cloud Agency, which had been moved the year before from its first location (1871-73), on the Oregon-California Trail and the North Platte River about 25 miles southeast of Fort Laramie, Wyoming. The agency’s mission was to control and issue food and annuities to the Sioux and Cheyenne. 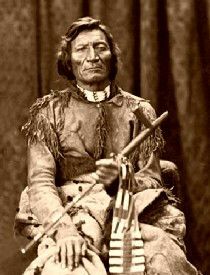 Among them was the recalcitrant Oglala Chief Red Cloud, who had refused to move onto the Great Sioux Reservation of western South Dakota, created by the Fort Laramie Treaty (1868), and insisted on residing in the unceded territory north of the North Platte. Life at the agency was hectic. At times 13,000 Indians, many hostile, were camped nearby awaiting supplies. Aggravating the situation were their non-reservation kin and Arapaho, residents of the surrounding unceded hunting territory who wintered near the agency to procure food. De facto rulers of the agency, the Indians kept the inexperienced, and often dishonest, agents and their staff in a virtual state of siege. The braves went on a rampage in February 1874 and killed the acting agent. The next month, to restore peace, the Army founded Fort Robinson adjacent to the agency and Camp Sheridan near the newly established Spotted Tail Agency, 40 miles to the northeast, which administered mainly the Upper Brule Sioux. Realizing the troops’ daily presence generated friction, in May the commander relocated the fort about 1½ miles west of the agency. But the Army could not prevent corruption in agency management, which infuriated the Indians. In 1875 a special Government commission conducting hearings at various locations throughout the Nation, including the Red Cloud and Spotted Tail Agencies, confirmed reports that agents, other government employees contractors, and freighters were profiting from traffic in Indian food and annuities, many of them inferior. The nationwide publicity aroused the ire of eastern humanitarians. A far stronger reason for Indian hostility was the violation of the Fort Laramie Treaty was represented by the 1874-75 mining invasion of the Black Hills of South Dakota for which the fort was a way station on the main route to the goldfields. In September 1875, first at the fort and then at a site eight miles to the east, government representatives tried to buy the hills from the reservation Sioux, but they refused. The fort supported campaigns in Wyoming and Montana the next year against the non-reservation and reservation Sioux and Cheyenne who united under Chief Sitting Bull and other leaders and overwhelmed George Custer in June at the Battle of the Little Bighorn. Following this campaign and a victory over the Sioux in September in the Battle of Slim Buttes, South Dakota, Brigadier General George Crook returned via the Black Hills to Fort Laramie, Wyoming. 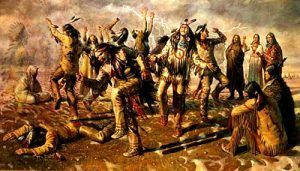 He then marched to the Red Cloud and Spotted Tail Agencies and put down a threatened uprising by disarming and dismounting Red Cloud’s Oglala and Red Leaf’s Brule. Crook and the other generals triumphed in their retaliatory winter campaigns. Some 4,500 Sioux and Cheyenne, including Chief Dull Knife and Crazy Horse, surrendered in the winter and spring at Fort Robinson and Camp Sheridan. As a result of a misunderstanding, in September 1877 the Fort Robinson commander attempted to arrest Crazy Horse. Resisting, in the guardhouse, Crazy Horse pulled a knife, a soldier bayoneted him, and he died a short time later in the adjutant’s office next door. An Indian rebellion was averted. The next month, however, the Red Cloud and Spotted Tail Agencies and their residents, in accordance with the Black Hills Treaty of 1876, moved to the Pine Ridge and Rosebud Reservations in South Dakota. In September 1878 the Cheyenne Chief Dull Knife and his band, who had been assigned from Fort Robinson to Darlington Agency, in Indian Territory, escaped and headed for their homeland. They were captured in the sandhills near Fort Robinson, where they were confined. They again tried to gain their freedom in January 1879, but troops killed some of them and captured the rest in what is known as the Fort Robinson Massacre. In 1890, during the Ghost Dance rebellion, elements of the black 9th Cavalry and the white 8th Infantry from Fort Robinson were among the first troops on the scene at the Pine Ridge Agency, S. Dakota. During the late 1870’s, ranchers had begun to move into the area around Fort Robinson and once the railroad arrived, in 1886, homesteaders followed. The presence of the post mitigated conflicts between the two groups. 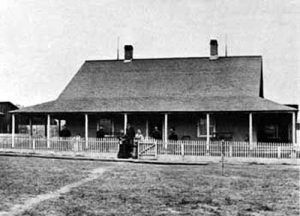 In 1890 the fort’s importance increased as a result of the inactivation of Fort Laramie. Remaining active through World War II, in its final years, Fort Robinson served as a cavalry base, remount depot, war-dog training center, and prisoner-of-war camp. Since 1949, or two years after the Army departed, it has been occupied by the Fort Robinson Beef Cattle Research Station, a joint enterprise of the U.S. Department of Agriculture and the University of Nebraska. Fort Robinson State Park consists of the principal historic buildings: six sets of frame-covered adobe officers’ quarters, built in 1874-75; and six sets of brick officers’ quarters, constructed in 1887. Several miscellaneous structures — storehouses, shops, and offices — date from the period 1886-1910, but the rest of the buildings are later additions. 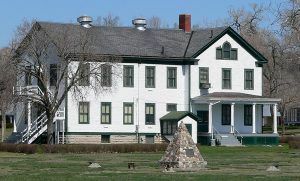 The Nebraska State Historical Society has placed interpretive markers around the fort area and maintains a museum in the frame headquarters building. The society has reconstructed the guardhouse where Crazy Horse was mortally wounded and the adjutant’s office, both built in 1874. At the Red Cloud Agency site, to the east of the fort, no remains are extant but a monument commemorates it and the state has conducted some archeological investigation. The historic scene is unimpaired by modern intrusions. 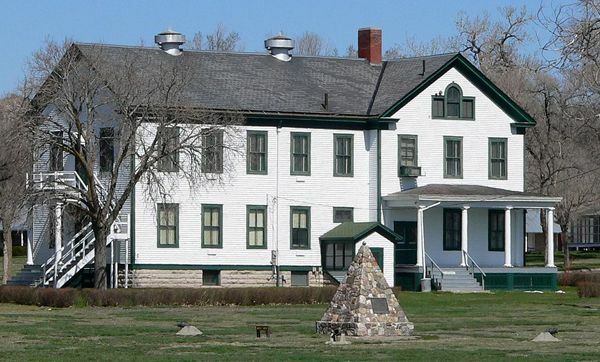 During the summer months, the Nebraska State Historical Society conducts tours to the site from the Fort Robinson Museum. The fort and agency sites are on lands owned by the U.S. Government and the State of Nebraska. The state park also provides recreational facilities including lodging, camping, fishing and hiking trails. Located in Dawes and Sioux Counties, Fort Robinson is on U.S. 20, about four miles west of Crawford. The site of Red Cloud Agency is on an unimproved road, about 1½ miles east of the fort.